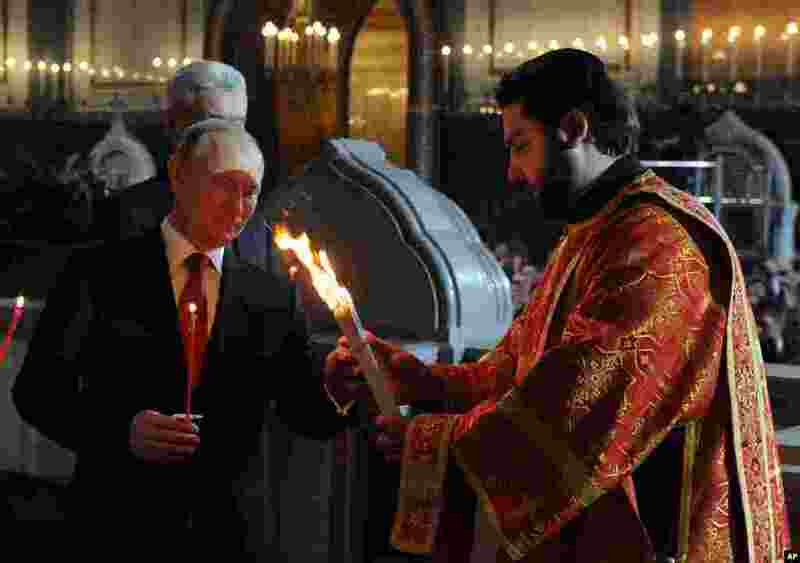 1 Russian President Vladimir Putin, foreground left, attends the Easter service in Christ the Savior Cathedral in Moscow, April 20, 2014. 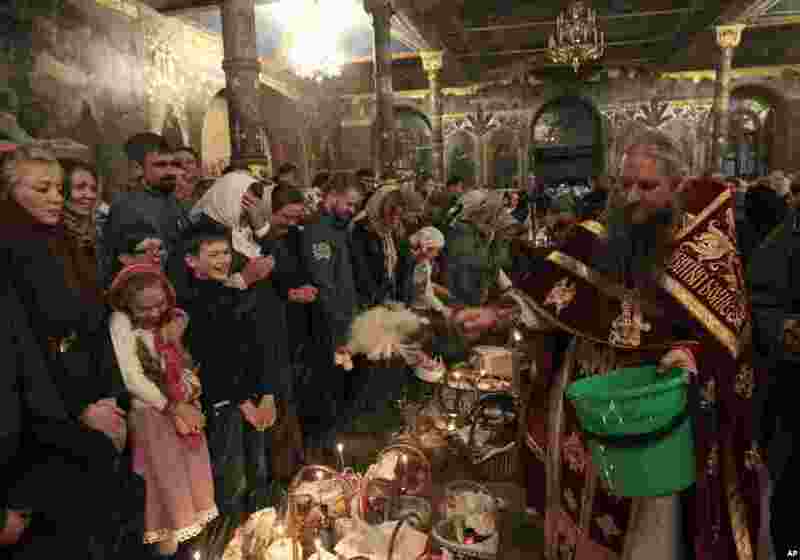 2 An Orthodox priest blesses traditional Easter cakes and painted eggs prepared for Easter celebrations in the Kyiv-Pechersk Lavra church (Cave Monastery), Kyiv, Ukraine, April 20, 2014. 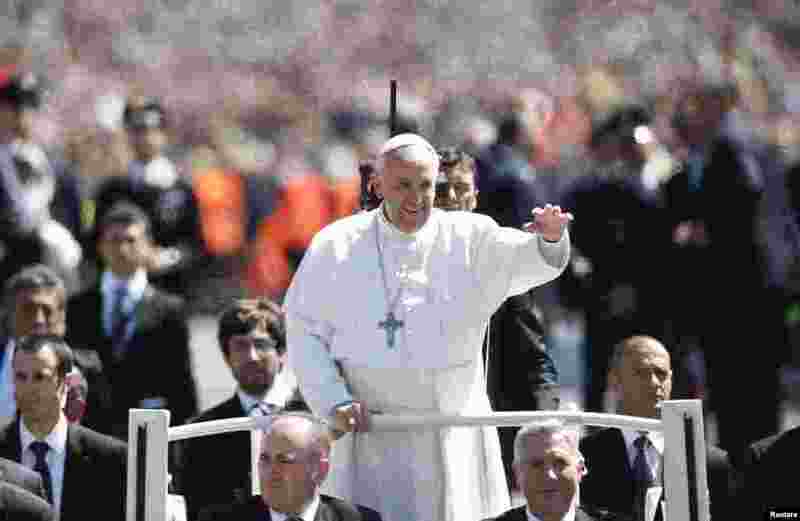 3 Pope Francis gives the thumb up as he leads the Easter mass in Saint Peter's Square at the Vatican, April 20, 2014. 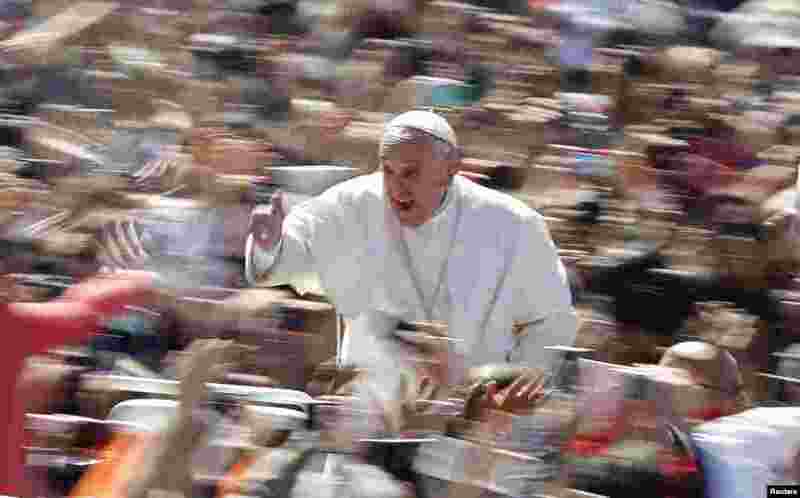 4 Pope Francis waves as he leads the Easter mass in Saint Peter's Square at the Vatican, April 20, 2014. 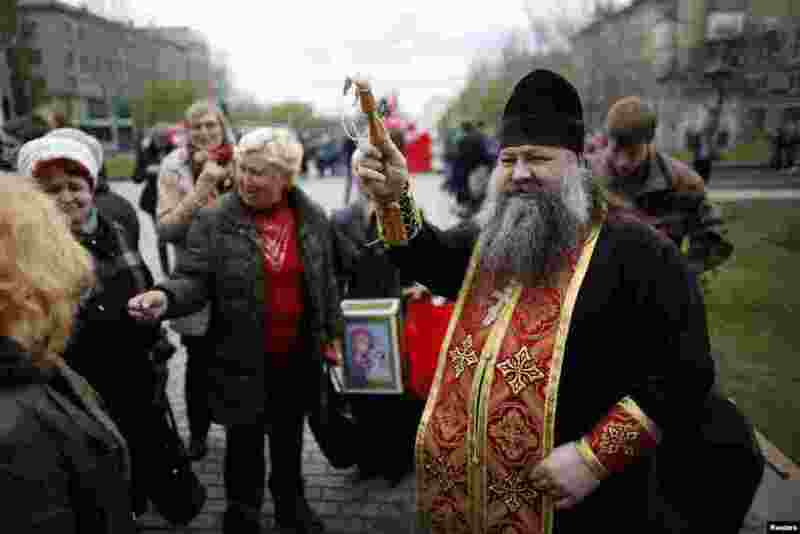 5 A Ukrainian Orthodox priest sprinkles holy water on worshippers outside a regional government building during Easter in Donetsk, eastern Ukraine, April 20, 2014. 6 Britain's Prince William and his wife Catherine, Duchess of Cambridge prepare to sign the First Fleet Bible and Prayer Book following Easter Sunday Service at St. Andrews Cathedral in Sydney, April 20, 2014. 7 Britain's Kate, the Duchess of Cambridge, meets members of the cathedral choir following an Easter Sunday service at St. Andrews Cathedral in Sydney, April 20, 2014. 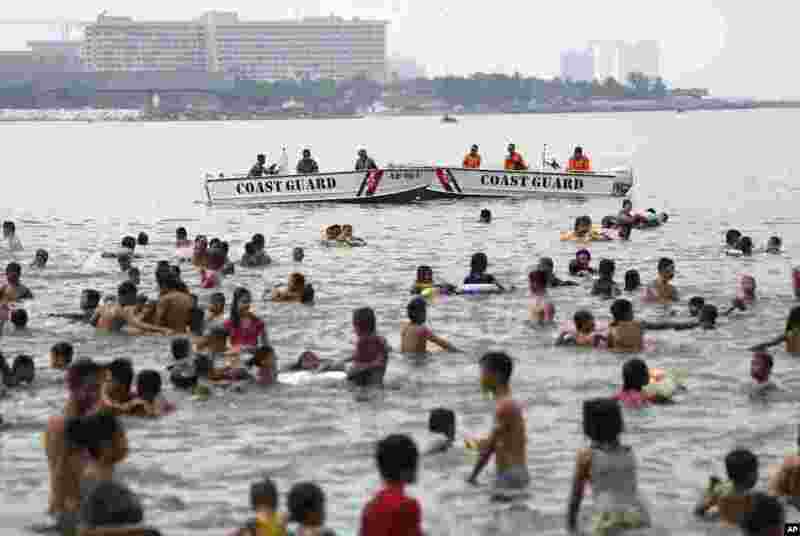 9 Philippine Coast Guard personnel stay beside people swimming just outside the U.S. Embassy as they celebrate Easter Sunday, Manila, Philippines, April 20, 2014. 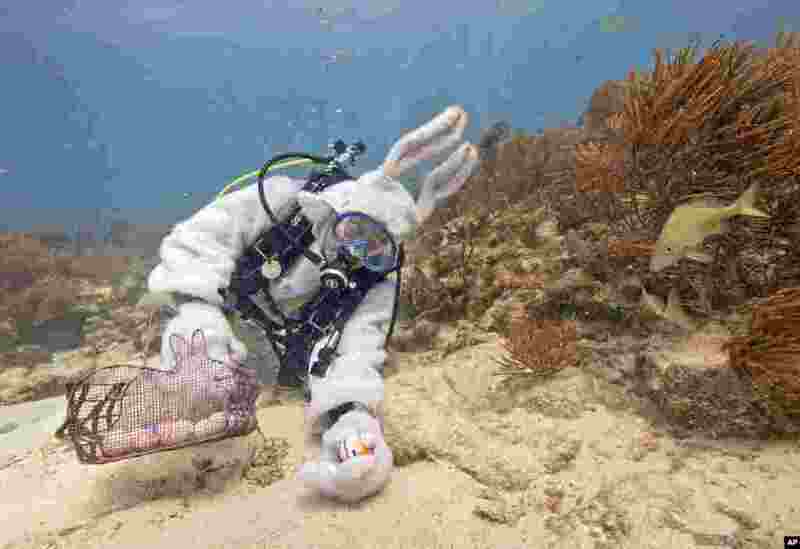 10 Spencer Slate, garbed as a scuba-diving Easter bunny, places hard-boiled eggs on the sea floor 2014, in the Florida Keys National Marine Sanctuary off Key Largo, Florida, April 18, 2014.